Sunday evening. You're sittin' around the sewer watching your main reporter, April O'Neil, do a live remote from the Statue of Liberty. Then it happened. A humunguso flying android screamed out of the sky and ripped Lady Liberty from her foundation, sending hundreds of freaked out tourists into the harbor below. "No way!" cried Raphael. "Way," replied Donatello. "And I'll bet you all the pepperoni in Little Italy who's flying that heinous scrap heap." Leonardo grabbed his Katana Blades. "Let's pop by our friendly neighborhood Technodrome and pay Shredder a visit." With the cunning of an ancient ninja warrior, you battle through the first three levels that lead right to the heart of the Technodrome. There you find Shredder controlling the metallic terror by remote. "You've been a bad boy, you bloated bean bag," says Leo. "But it's nothing a good thrashing can't fix." After you defeat Shredder, he goes over the edge, knocking everyone into an activated Matrix Translocation Beam. With a flash you're all sent back in time. Now you have to fight Shredder and his horde of historic hooligans through six levels of utter weirdness. You've read history in class. Now it 's time to rewrite it. --From the SNES Teenage Mutant Ninja Turtles 4: Turtles in Time instruction manual. Play Teenage Mutant Ninja Turtles 4: Turtles in Time Now! The evil Shredder has stolen the Statue of Liberty! What is his evil plot this time? Sending the Turtles back in time, of course! The Turtles will have to battle through the past and future to find their way home! 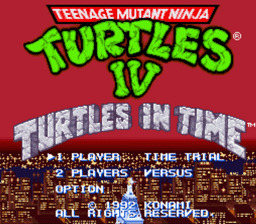 Turtles in Time made great improvements over the previous Turtles games, mainly because it was on the Super Nintendo this time. The graphics were updated, with more detailed sprites and backgrounds, making the gaming experience that much better. Very similar to the cartoon series, good animation as well. Also the various stages were each quite different, so you got a look at several backgrounds, not just the same thing with different colors and tile-sets. Use your turtle of choice to beat up the Foot and take down the Shredder. You've got a couple of moves you have to string together to make it through this adventure. Your basic attack is going to be your most valuable asset. For a more powerful attack, press attack and jump at the same time. Flying Kick- In the middle of your jump, press attack. Weapon Slice- At the top of the jump, press attack. Hop Kick- As soon as you leave the ground, press attack. Drop Kick- Just before you hit the ground, press attack. You can use the dash feature with jumps and attacks to trip up your foes(You can change dash to a manual double tap instead of auto from the option screen). Once you start dashing, press attack to do a body slam. The body slam can break enemy blocks. If you press jump while dashing you will do a flip. Press attack during the flip to do a sliding attack that will knock over enemies. Throw: To throw an enemy, stand next to them and hold the attack button.